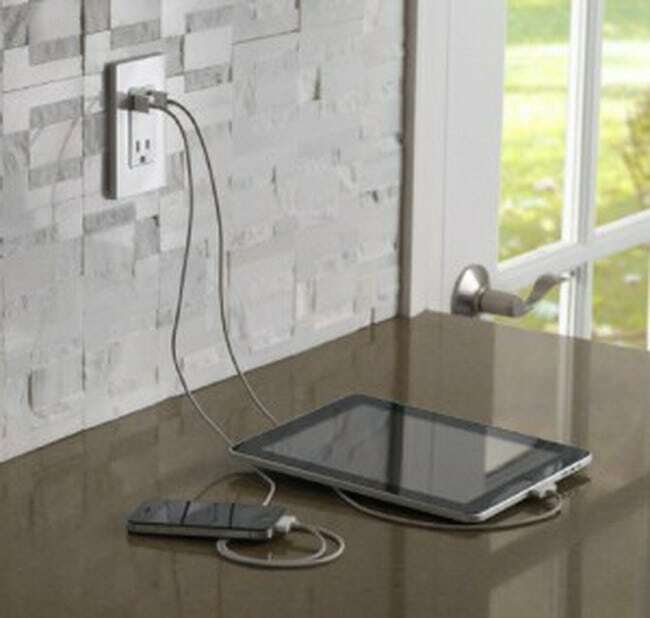 There are some AMAZING options today for changing your electrical outlets to fit your lifestyle. 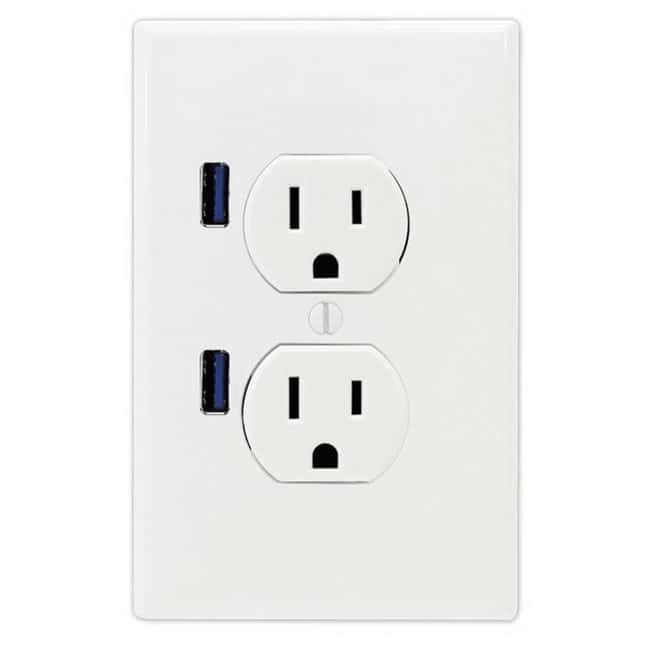 Recently on the market are USB and Outlet Combo units to charge your Mobile devices and plug anything into the wall needing standard electricity too! 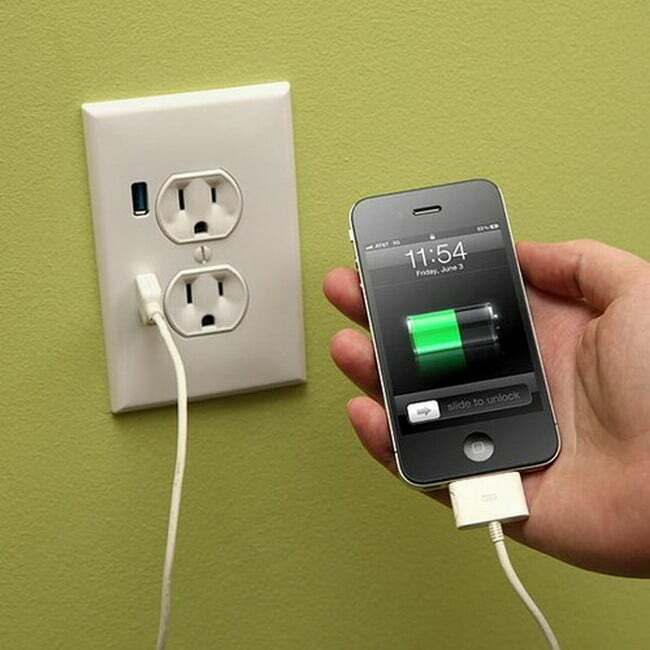 The best part about these are that they are around $15 dollars at any home improvement store and can be easily installed if you know a little bit about electricity. THE BEST PART?? These units actually charge your iPhone or mobile device in 1/3 LESS TIME!! This is because the USB is DIRECTLY connected to the wall and PROVIDES MORE AMPS which equals faster charging times. Here is the complete specs from the manufacturer…. 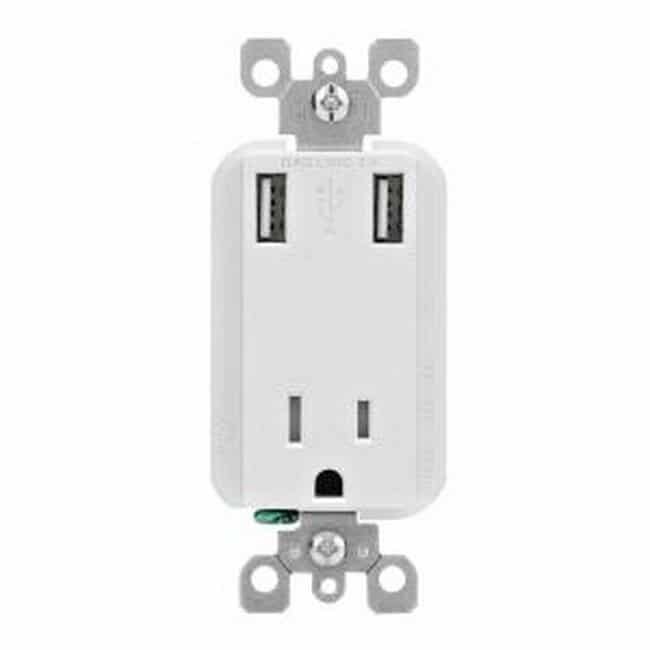 Leviton’s USB Charger/Tamper-Resistant Receptacle offers a ground-breaking 2.1 Amp of charging power and a 15 Amp/125 Volt Tamper-Resistant Receptacle. This state-of-the-art device has the ability to charge up to three electronic devices at once utilizing the USB ports and the receptacle. The USB ports are type A, 2.0/3.0 and are controlled by a smart chip which recognizes and optimizes the charging power of your device. This means you can spend less time charging your device and more time enjoying it! 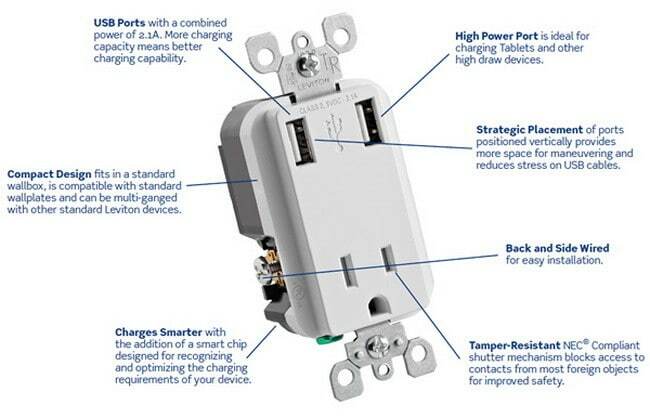 Leviton’s USB Charger/Tamper-Resistant Receptacle is ideal for charging tablets, smart and mobile phones, e-readers and much more. There are some drawbacks for long term use of higher amps…. The faster (higher amps) a charger you use the faster your phone will charge. Fast charging cycles affect the longevity of the battery. The higher amps the charger is, the quicker the battery will start being less efficient. If you use a 2 amp charger every day, the battery may only last 200 charging cycles before you start noticing that your battery is getting weak. Perfect pair, the iPhone and a newly installed USB / Electrical Outlet Combo. Perfect for charging your iPhone and iPad at the same time and BATTERY CHARGES FASTER!! Here is another style available from most home improvement stores.